This man should not need any introduction to the many who have followed this blog since its inception in April of 2008. JD Weldy is the former owner and writer for "David's Musings." 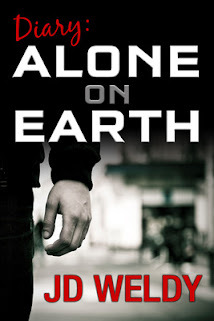 JD has one novel in ebook format (Diary: Alone on Earth). He is compiling other short stories and novellas that he says will be available on Amazon before Christmas. He is involved with many other writing projects involving a couple of publishers. JD teaches a Creative Writing class at a local community college in his spare time. He is one of the more highly regarded bloggers/writers among the online community. Please join me in welcoming "home" JD Weldy as our guest poster on the Paranormal/Supernatural topic. As I stated in Part II, my mother went to see my ailing grandmother. It was just me and my father at home since my little brother, Ben, accompanied my mother on the long train ride. She came back five days after my father's encounter with the man in the closet in my room. My dad kept tight-lipped about what he saw. He would not tell me anything. Upon my mother's arrival, we went out to eat dinner at a local restaurant which was a very rare treat for us all. When we came back, Mom told us to get ready for our bath and then bed. When she said that, I looked at my father. He had already told me that he was going to have both Ben and I sleep in the same room with him and our mother. "I was about to tell you, I think we have mice in this house, honey. For that reason, I think we need Ben and David to sleep in here with us until we can get someone here to get rid of them. I'll make them a thick pallet here on the floor," my father said. My mother looked at my dad completely dumbfounded. "What do you mean they will sleep in here on the floor? The mice would be more likely to jump on their pallet than in their beds in their room. They can sleep in their own beds until we get an exterminator out here," said my mother. My father was upset. He had seen something in that closet which had quite literally caused him to come almost unhinged. "It may have been rats that I heard in their room. I don't feel good about them in that room. Maybe I can get a small cot and they can sleep on it in our room," father said. My mother was naturally curious. She told my dad there was something he wasn't telling her. But, our father got his way on this. He got a small cot out of the storage room and brought it into our parent's room. It was a tight fit, but we all fit in close together. My mother was very upset. She knew there was more to this than she was being told. But, she kept quiet about her feelings on this. The next morning, mother laid down the law. "Tonight the boys have to sleep in their own bedroom. Last night was a nightmare....literally. I could not sleep with everyone in such close proximity. It was hot, miserable and uncomfortable. Unless there is a really good reason for them not to sleep in their own beds, I see no reason for them to not sleep in their own room tonight," said a very irritated mother. My dad, for once, said nothing. He could not reveal what he saw in that closet. He wouldn't even tell me what he saw in the closet. But, whatever it was, it scared my dad enough to have all four of us squeeze into a bedroom too small for that number of people. After breakfast, my father came up to me, "David, I know I said that you and your brother could sleep in our room. I'm not going to tell your mother or you what I saw in that closet. I suspect you may have already seen it. I'm coming up with a plan with whatever that is in your bedroom closet. Do not be afraid. I will leave your door open and leave our door open. You see or hear anything, come into the room and whisper for me. Now, get ready for school and don't worry about this. This is my problem, not yours," said my father. He made me feel better. But, at the same time, it wasn't my father sleeping in the same room where there is a demon or something similar in our closet. I was not looking forward to bedtime tonight. At 8:30 PM, Ben and I were told it was time for bed. Usually, we got to stay up to 9 PM even on school nights. Ben asked why so early. Our mother said she was going to bed early since she got little or no sleep the previous night. So, if she goes to bed early, so do we. I slowly walked to our bedroom. As I pulled back the cover, got a kiss from my mother and hug from my father, my dad looked at me to say, "Remember what I said, David." "I remember daddy. I'm not scared," I lied. I was scared to death. What the man in the closet was, I have no idea. But, whatever it is, it needed to leave our house. Mom turned out the hall light and she closed their bedroom door. My father quickly opened it. Words quickly were said that were inaudible to me. But, the door stayed open. I laid back and looked at the closet door. It seemed peaceful and serene. Dad had completely taken everything out of that closet. Of course, mother wanted to know why. I don't remember what my father told her. But, she accepted it. I laid down...and waited. I must have dozed off when I heard the first thump inside the closet. I looked at the wall clock. It was one of those fluorescent clocks that you rarely see anymore. I'll never forget it had Snow White and The Seven Dwarfs. Of course, the other four digits were occupied by Goofy, Pluto, Mickey Mouse and Donald Duck. I will never forget that clock. The time was 2:20 AM. But, my attention was with the thump from the closet. 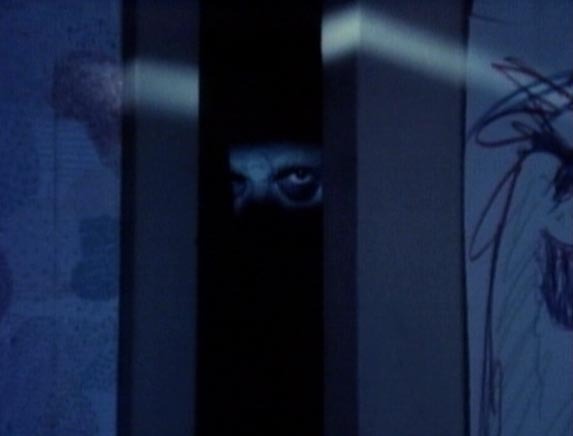 I heard the now all too familiar "hee hee" giggle from the closet. At first, I did nothing at all. But, there was another thump, but it was louder this time. I got up and went to the closet. My right hand was trembling as I reached for the door knob of the closet door. I opened the door and it was total darkness. I mean it was midnight dark in there. There was the nightlight next to Ben that should have shed light into the door. I noticed the light from the nightlight did extend to the closet door....and then stopped. That was impossible. But, even the light did not cross over into the closet! I placed my hand into the closet....and I quickly drew it back to my chest. It was freezing in there. I stood there waiting to see what was going to happen. I wasn't going to go back to sleep anyway. I stuck my left foot into the closet...it was still cold. When I say cold, I mean Artic freezing type cold. But, the coldness did not extend beyond the edge of the closet. I decided to go into the closet (as stupid as that sounds, please remember I was only 5 years old) to see what would happen. I stood in there and held onto the closet door (I was young, but I wasn't stupid). I remember that the coldness was so bad until I felt my face and it was becoming numb from the cold. I heard....a whisper. I couldn't understand it as first. "What did you say,?' I said to the dark closet. Nothing but the cold that was about to be too much for me. I had been in there about 2 or 3 minutes. But, the cold was unreal. I could still see the nightlight shining toward me and on the hardwood floor. But, it still stopped at the closet door. I decided to come out....and something wet, scaly and cold......grabbed me by my left ankle to stop me. "Come with me to my playground, David. You'll never have to go to school and have all the candy and cake you can eat," whispered the voice. I jerked my foot to get the man in the closet to let go of me. His grip became stronger and stronger until I screamed, "DAD, IT'S GOT ME!! IT'S GOT ME!! HELP ME! HELP ME! PLEASE HELP ME DAD!!!! My dad was in there in about two seconds! Suddenly I hurled forward right into the foot of my bed. Ben started screaming and lights all over the house came on. "David, what are you screaming about,?" my mother asked. "Something in the closet grabbed me and wouldn't let go, Mama!," I screamed. My mother turned on the lights in our bedroom and asked, "David, what on earth happened to your ankle?" mother asked. My ankle had turned purple from the grip of the man in the closet. "I'll tell you what happened to his ankle," my dad said. "THERE IS SOMETHING IN THAT DAMN CLOSET!!! I KNOW BECAUSE I HAVE SEEN IT! AND IT HURT OUR SON!!! WE'RE MOVING!!!" screamed my dad. We all just stood there motionless. We were just looking at each other. No one said anything for a couple of minutes. Finally, my mother spoke up. "I know there is something in the closet. I know because I've seen the same thing since I was a child," our mother quietly said to our complete and utter astonishment.